I’ve seen a lot of sunrises in the past three months. Some have been shame’s flashlight, burnt orange, Vegas disasters that made me curse myself and everything around. A few have been black, through-the-curtains assumptions, the product of a baby who insists on breakfast before birds insist on singing. Many have been slow, children’s-book-lavender movies over the Blue Ridge foothills, affirmations of my choice to get up early and get some exercise before the day began. Sunrises always seem somehow prepared, something that’s being given to me, something that’s meant to remind me of something. It’s a mental, romantic construct. I have no doubt of that. But, I’m a mental romantic and have never claimed to be anything but. I saw another sunrise this morning, one accompanied by two tired children, the sizzle of eggs on the stove, and the tinkle of Garcia and Grisman doing So What in the corner. I hugged the kids, kissed them both on the head, and then stood over the eggs with tears in my eyes. Three times this month, I’ve looked up from my computer screen with wide eyes and an unholy expletives in my mouth. Each time, I’d just learned that someone had died. The first was an old friend’s father who had been hit by a bus. The police said it was the bus driver’s fault. Next was a couple I’ve met in passing, but is well-known in my industry. Their four-year-old son drowned. The next was a college friend’s wife, hit and killed by a car while pumping gas on the way to pick up her kids. These are not my tragedies. I can’t claim them. My only hurt is for the people I know who were close to the victims. It’s almost unseemly for me to even put any of it here, and I wouldn’t but for the fact that all three have happened so close together, and that I saw the sun rise again today. A long time ago, my wife and I came to an agreement about what and how much of our personal lives I would expose on this little blog. Said agreement keeps me from embarrassing myself or others unnecessarily. I don’t think I’m in violation of the rules, however, to explain that my wife is a worrier. Like my mother, my wife spends at least 50% of her waking hours worrying about something. 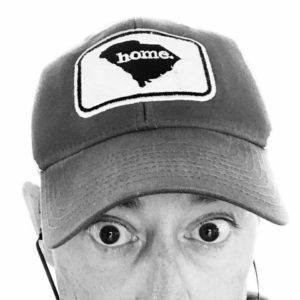 It’s compulsive and more than a little frustrating for a guy like me–a guy who worries about nearly nothing…until it’s too late, the bad thing has already happened, I have to clean up the mess, and I worry about how I could’ve been so stupid to not have worried about it in the first place. It’s yin and yang, push and pull, and all the stuff I assume marriage is about (married just ten years, I figure I still have some time to figure out the rest). My wife worries about the kids, about her health, about my health, about the security of our home, about her friends, about her family, about people she has never met, about whether she’s going to be able to sleep, about why she’s not sleeping, about how tired she is, about whether the sky is falling, and about why she worries so much. That is, in short, I always wake up expecting the sun to have risen. My wife lies awake worried that the sun won’t rise. While I don’t worry much, I brood. I’m a pathetic brooder who has inflicted more than a few family members and close friends with endless discussions on the state of my life, job, and future. In retrospect, it’s all terribly embarrassing. I try not to do it, but that ends up making me look like one of those speechless, pensive people that can be just as annoying. Hell, half of this blog is just that…brooding, reflective, redundant. Perspective can do a lot for a guy. It’s not been 72 hours since I was rolling around in a pool of my own wasted self-worth and inflicting my already-worried wife with yet another reason to fret (this time, that her husband was in danger of deep-end-diving once again). Suddenly, in the light of day, under a sunrise that three people won’t see, under a new day that won’t warm the hearts of the people missing the people they love, I can look across the room and see the reason my sun comes up every morning. One is a beautiful woman who props me up even when she doesn’t find time to do it for herself. 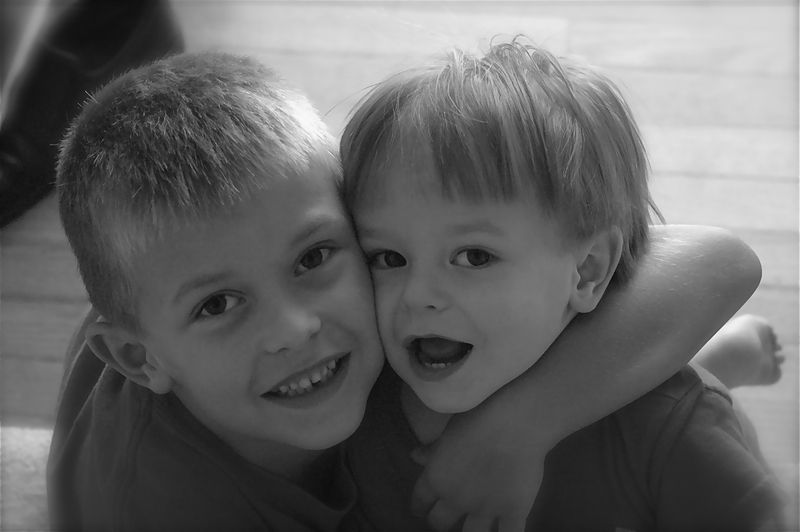 One is a six-year-old boy who is growing into a little man and astounding me daily. The other is a toddling, smiling boy who screams “Da!” when he wants me and dances to Robert Randolph. I realize, there is a middle ground between worry and carelessness, and as a team, my wife and I are working to find it. In any case, in the light of this day, we recognize how undeservedly lucky we are to have this life, that we haven’t been faced with losing what means most to us, that–in spite of all the mundane stuff that can tilt us–as long as the sun rises on these four faces, we can ask for nothing more. If somebody loves you, love them back. If you hurt somebody you love, make it right before you do anything else. If you have children, hug them every night. If someone is willing to be married to you, they should hear “I love you” every day, because being married to anybody is hard work. Ask yourself every day what you should be doing, and then do that. Do those things, count on the sun to rise, and live knowing you are prepared for the day it doesn’t. 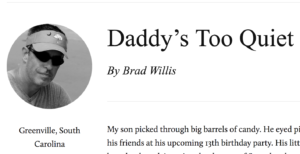 Beautiful blog, Brad. It’s easy to get caught up in the day-to-day worries and obligations of life that we forget to stop and realize what we do have. Every day, we read about or are personally touched by examples of how life is not guaranteed, at any age. I can relate to your wife, as I am a worry wart myself. Thanks for the reminder to enjoy today with my loved ones. My philosophy is that my kids may drive me insane on their bad days, but there are so many parents who would give anything for that to be the only problem with their kids. I’ve worked with terminally ill children and anytime I feel overwhelmed, I stop and thank God that my kids are just in a mood and not hooked up to a chemo machine or fighting for their lives. That reminder gives me the ability to hug their necks in their worst moments and tell them that I love them. Most people can relate to this, kids or not. I’m one of “those guys”. I tell my wife I love her dozens of times a day, call my mom twice a week to tell her, and when I tell my cats I love them, my voice gets very high and squeaky. The most important thing is is not in just saying it; it’s how you say it. Over the last couple of years I have developed a relationship with my maker, and my capacity to love and capacity to not worry has advanced immensely. It’s no accident…I have help from above. Keep writing, my friend. It is your gift that comes from the same place. It’s also no accident. Personally, I, The Rooster, love the self-loathing, the glass is half empty and going empty very soon, Otis. Just for the record. As for Mrs. Otis…just a saint…PERIOD! It wasn’t until three years ago that my wife finally admitted that it was more than an occasional mood problem after years of me proding her to see a doctor. We could have given up several times in the past 10 years, and I certainly would not have blamed her, after taking care of me after the head injury for nearly six years and me giving up on what appeared to be a bleak future. But, the past has made our marriage stronger and while we’re not blowing rainbows and portrait-like sunrises out of our asses every day, at least there’s no worrying about raising our kids with two people who don’t care about each other any longer. Accepting one and other for who they are is the first step every couple should take. When my wife finally figured out that I enjoy the late nights writing about poker and tend to gamble/drink more than most, she embraced it. Despite being a degenerate at times, she trusted me continue to work hard, pay the bills and still find time to put together a Dora the Explorer puzzle with our daughter or play some soccer with our son, and find time to watch the Twins while entangled in bed after the kids brushed their teeth. I hope you two continue to take in as many sunrises as possible and enjoy each one before the rush of the day takes place. Another outstanding bit of sharing. Thanks. FWIW I’ll be sharing it with others. I don’t know Rooster, I kinda’ like this half-full glass Otis. He makes me feel all warm and fuzzy inside but then again, so does a good Scotch and a trip out to ‘somewhere’ to see good friends. Here’s to the Sun shining on all four of your faces, for many, MANY more enjoyable years to come!